It is often thought that incapacity (either mental or physical) affects only elderly people. This is of course not true. 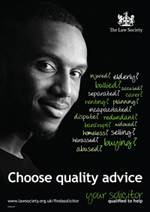 Whatever your concerns regarding old age; whether for yourself or others, you need someone to turn to for advice. If you find yourself in a position where you need to look after someone else's affairs and there is no power of attorney, you can rely on us to guide you through the court process to obtain a Deputyship Order. We are committed to trying to ensure that all our clients have in place documents that will ease their nearest and dearest and loved ones through the pain of a relative becoming incapacitated for whatever reason.